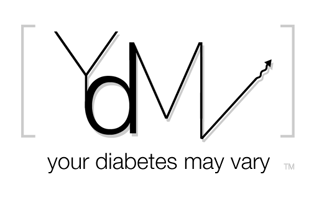 Your Diabetes May Vary: Musings on NPH and the meaning of life. I sometimes think those of us who frequent the diabetes online world can scare people with heart felt and school of hard knocks experience. I think at times we leave new people with the idea that they are doing something wrong by following their Doc's instructions and using NPH. That is a mistake (making people feel that way), I am sure nobody has that intent but I think I see it happen, so here are some non negative thoughts on NPH. NPH worked well for us for the first 3/4 of a year or so for each of our kids. I have come to see that was successful because the NPH was supplementing partially functioning beta cells that could make up the difference but not carry the load of insulin production. So, I see it as a judgment call to go with more injections in a basal insulin (Lantus) and bolus program vs. initially fewer injections with a program using NPH. Most of us are in a newbie state of shock about giving shots at all, and are not really in the best place to make an informed choice about more vs less shots and insulin curves at diagnosis. I can't fault a Doc for an initial NPH program, particularly with a needle phobic parent, like I was. Part of the art of medicine is the whole patient thing. It is appropriate and correct for the care givers to consider the stress of giving shots and the patient reaction to that. I think it is important that as we become experienced, possibly opinionated, professional diabetes parents (PDP someone get me a copy right on that!) that we keep in mind where we came from. I had a hard time with shots at all at first. I would have had more stress with a Lantus program with a basal insulin for every thing the kid ate. Maybe just Lantus would have worked. I can’t say. What is important is getting on insulin and learning to manage it. That is a life saving change. Once you have done that selecting different management tools like insulin, pumps, pens etc is about convenience and incrementally better results. Life saving vs. incrementally better. There isn’t one person on any diabetes web board who wouldn't use NPH tomorrow if the world supply of Lantus and or pumps disappeared. As PDP we need to keep in mind that holistic thing and that some of us (ME) were needle phobic (kind of funny to think that way now.) NPH may not be the cutting edge but it is a lifetime better than the no insulin at all of a hand full of decades ago. I, for one, am perfectly content that using NPH was a good first step for us. I am also comfortable that moving to a pump was something we were ready for but it may not be right for everyone all the time. I hope there will be advances that provide us with other and for us better approaches in time. IMO you’re over thinking the entire process. Until you get comfortable with T1 you’ll tend to concern yourself with a lot of extraneous issues. A T1 needs tight control and that can be done with NPH. I’ve done it with NPH for 50 years. Use corn syrup if it helps you attain tight control. Parents that get too involved with JD management can create more problems than they solve. may i ask do you have a child with diabetes.. being an adult diabetic that is done growing, done going thru puberty and basically eats the same everyday vs a active growing child who's daily eating habits variey by day are 2 diffrent things.. I have nothing against NPH.. but as a parent who's 3 years will eat a ton of food one day and barely even look at food the next, and who growes 3 inches in less than a year.. NPH does not work for us.. I dont feel that bennet is over thinking any thing at all.. bennet is thinks of this as a parent with 2 t1 kids where you are as an adult that NPH has been what works for you for 50 years.. being a parent of a t1 kid ( infant or teen) there are several extraneouse issues that adults do not go thru. I think you are both right. Hwo knows "deleted" may have been right too. Unicore's point is do what works, if that is NPH fine. Zimbie makes the very valid point that kids, growing kids, swim in a sea of hormons that make them grow. Using NPH requires less variability than works for many kids lives. We need to get zen with the idea that one size, or one insulin program, doesn't fit all. I agree that not one size fits all. However Julia never used NPH. I really wanted lantus, and already had some knowledge because my husband is T1. I did not want to "feed the insulin", or have to eat at such and such time to catch the peak. I do think because 4+ shots a day was what Julia knew, that she got used to them more, and that many injections was never an issue, in fact before we started pumping Julia would take about 6 or 7 injections per day depending on snacks. I really wish more doctors would give choices of treatment rather then handing someone NPH. Personally other then it comes from an animal, if I had to make a decision out of the older insulins, mine would be beef. 24 hours, peak at 4 and 8 hours. No more stable, or less stable then NPH, but issues arise from it coming from an animal, so that is where the downfall really is.